Kuala Lumpur, 27th June 2008: It was a bleak February afternoon. Me and a pair of peacocks huddled together under a tree, seeking shelter from the persistent rain. The birds appeared rather nonchalant of the stranger by their side. The rain eventually stopped and as the colourful couple headed for home, I took one last picture of them. That picture would later end up in a brochure for a new Olympus camera. A few days before the feathery encounter, I was summoned to the Olympus office. I was handed a top-secret camera and commissioned to take some pictures that would demonstrate the new camera's attributes. The camera was unbranded and unmarked, though it looked suspiciously like the E-510 (it was to replace). I was given a free hand but with the very tight deadline and bad weather spell, I was able to use the camera for only a few short days. The resulting raw images were copied into DVD-roms and quickly couriered to Japan. As with most assignments, I rarely get to see the final results --- be it in a magazine or on a billboard --- as it usually appear in some other country, and often months later. A few days ago, I finally sent my Olympus E-3 dSLR for servicing, after dropping it into a river. I have since used the tank-like (and almost amphibious) Olympus E-3 on the road in Brunei, in the harsh jungles of Borneo and on the sizzling tracks of the Japan GT without any problems. Since I am back in town, I might as well get it inspected and have the firmware updated. I saw the new E-520 brochure on the showroom shelves at the Olympus service center. The camera was launched in May and became available here this month. I was pleasantly surprised to see how well the images printed. The Ferris Wheel picture was photographed at a very slow shutter speed, without a tripod. The very effective built-in image stabilization also allowed me to hand-hold a telephoto lens in low light for the bird portrait. 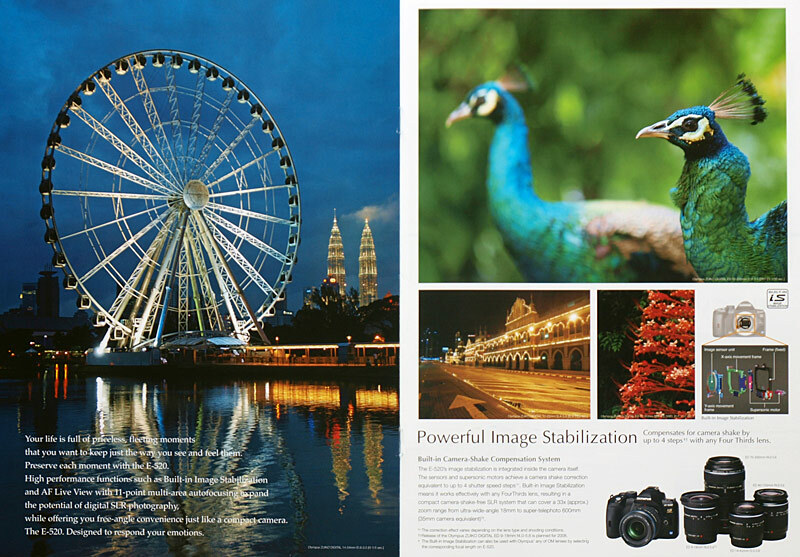 If you are in a camera store, pick up the brochure and see the stunning image quality (of the camera) yourself. the floor of my balcony. It was photographed with the E-3 using diffused sunlight, under the shade.